Field Marshal Edmund Henry Hynman Allenby was a native of Nottinghamshire, being born at Brackenhurst Hall near Southwell in 1861. 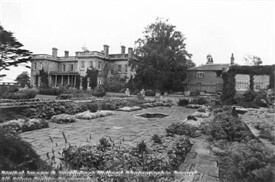 Brackenhurst had then been the home of his mother's family for about 50 years. Allenby was born at Brackenhurst on 23rd April 1861 (St.George's Day) and died in London on 14th May 1936. He is buried in Westminster Abbey. Allenby entered the Army with the Inniskillin Dragoons in 1882 after studying at Sandhurst. 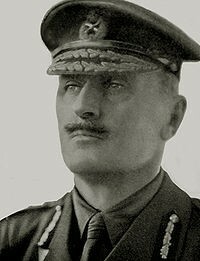 He was a column commander during the Boer War (1898-1902), a cavalry commander and later chief of the Third Army on the Western Front during the First World War before taking command of the Egyptian Expeditionary Force. In 1919 he was appointed high commissioner for Egypt, returning to England in 1922 after Egypt’s independence. Allenby was a keen naturalist, with an absorbing interest in wild animals, birds and flowers. He first made a name for himself in South Africa, where he fought with distinction in the Boer War. In August, 1914, he went to France in command of the Cavalry Division, subsequently commanding the 3rd Army, and in June 1917 he became commander of the Egyptian Expeditionary Force. On his appointment, the Prime Minister, Lloyd George, told Allenby he wanted Jerusalem as “a Christmas present for the British nation”! The Palestine Campaign fell into two phases – first the advance from Gaza to the capture of Jerusalem on 9th December, 1917 – the Christmas present the Prime Minister had asked for, secondly the great advance in the spring of 1918 to just north of Aleppo and Damascus, which marked the end of the Turkish resistance in October 1918. The first phase was largely an infantryman’s battle, due to the difficulty of finding water for the Desert Mounted Corps, but in the second phase the cavalry went through in the coastal sector and the leading troops were 75 miles beyond their starting point after 36 hours. The speed of the advance from the original front line on 19th September just north of Jaffa to Aleppo on 26th October was some 400 miles in 38 days. 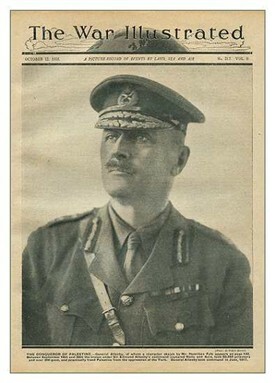 Allenby was created Field Marshal and enobled as 1st Viscount Allenby in 1919. From 1919 to 1925 he served as High Commissioner to Egypt, after which, in retirement, he became Rector of Edinburgh University. On Thursday, 20th December, 1973, a memorial plaque to commemorate his birth was unveiled at Brackenhurst Hall, (which by then was the Nottinghamshire College of Agriculture) by Group Captain H.I. Hanmer, D.F.C., of Westhorpe Hall, Southwell, who served with General Allenby throughout his Palestine Campaign, 1917-18, as a pilot in the Royal Flying Corps. Also present were Colonel Hugh Tallents of Newark, and former Provost of Southwell, the Very Rev. 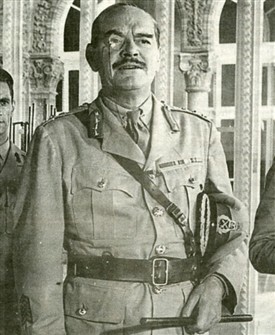 Hugh Heywood, who also served with Allenby. “Allenby”, said Group Captain Hanmer, “was a kindly man who took great interest in all around him, but he had a fierce temper, which when roused resulted in terrific explosions”. For this reason he was known throughout the Army as “The Bull”, and such was the awe felt for him that when he left his H.Q. to see his troops, the mystic signal B.L. preceded him, meaning “The Bull is Loose”, but it was usually sent as “B.B.L.”, the first could be easily interpreted! The plaque was paid for and presented by the Brackenhurst Old Students’ Association, and Group Captain Hanmer said he was sure that, could Allenby have known his birthplace was to become an Agricultural College, nobody would have been more pleased, and he hoped that the plaque would be an inspiration and reminder to future generations of a great soldier, administrator and English gentleman. This page was added by Website Administrator on 04/11/2011. I would like to say a few quotes about Group Captain Hanmer!. Having, working at Westhorpe Hall as a child , being quite small, 13year old boy the Group Captain named me Shrimp after a gypsy boy he once knew, he was a great man with many stories from all the painting in his office at Westhorpe Hall. HE LOVED HIS HORSES and on saturday's after morning stable we would drive around the estate in his old landrover [F reg] me being the young boy jumping out and opening the gates and closing them. He was kind with his words with me teaching me a few things whilst driving around and i still quote one of his be lessons [you must always have eye contact whilst speaking with people as you can tell many things from there frowns , to grins, what he really mean't is to see if there being honest!..] on one day we got stuck inbetween the hills around the estate near the Dumble itself, i said that i would run back to the Hall and get help as he was almost ninty yrs old, but he said no Shrimp we shall walk in his stern way. and walk we did the Group Captain marched on home with his walking stick .. a great fellow with a lovely wife who looked after me well for many years, Lady Frances. Brian Gardner's book "Allenby" (Cassell, 1965) points out, of course, that Allenby was with T.E. Lawrence (Lawrence of Arabia) in Palestine, and that Lawrence thought very highly of him. Gardner gives two quotes from Lawrence: "Allenby was morally so great that the comprehension of our littleness came slow to him" and "The dream-like confidence and decision and kindness which were Allenby. What an idol the man was to us"
I lived on Westhorpe, Southwell from September 1973 until the summer of 1978, firstly at Home Farm Cottage and then at Hall Farm House, now no. 80 Westhorpe. Both houses belonged to Westhorpe Hall and Group Captain Hanmer was kind enough to allow me to become a tenant at Hall Farm House in 1975 when I was looking for somewhere to live. At that time it was uninhabited and needed some minor work on it to make it habitable. I remember once going round to Westhorpe Hall next door to pay my quarterly rent to him (then the princely sum of £97.50 for 3 months!) and he told me that he had served in the Royal Flying Corps in Turkey and proudly showed me a silver cigarette case with a deep dent in it, he said caused by enemy fire. He was convinced that the cigarette case had saved his life and I could believe it!